Dollar Tree (DLTR) is expected to post third-quarter results on Nov 29, Thursday, before the opening bell. The Street expects earnings $1.14 a share on revenue of $5.55 billion for the period. The trade war between the Trump administration and China have caught up to the retailer, as fresh taxes on imports worth $200 billion have resulted in price escalation affecting the arrival of low-priced consumer items. While usually tariffs were slapped on industrial goods imported from the Asian country, this new predicament has forced Dollar Tree and its peers to sell the products at old prices for losses or pull them from the shelves. Other discount store operators like Dollar General (DG) are no different due to the new tariff regime. If the taxes are not rolled back, profitability will be under pressure in the long term, resulting in headcount reduction and store closures. However, the market has hopes for Dollar Tree. Many big-time investors have recently increased their holdings in Dollar Tree. In the third quarter, Price Capital Management Inc. added $106,000 worth of shares, while SRS Capital Advisors ramped up its holdings by 250% with an additional 1,009 shares. Institutional investors now own 92.83% stock, indicating a possible long-term growth. 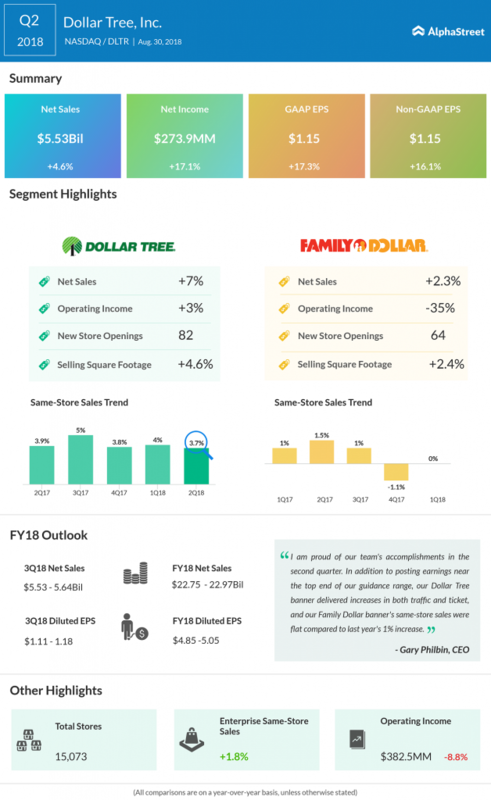 In its second quarter that Dollar Tree reported in August, revenue and net earnings showed impressive growth, while same-store sales were a let down in both Dollar Tree and Family Dollar arms. The results missed estimates, which triggered a short slump in shares. Investors will be looking for impressive numbers this quarter, especially comparable sales as the retail market is on scrutiny after the wave of e-commerce led by Amazon (AMZN) and Alibaba (BABA). While these online players are looking to diversify to brick-and-mortar stores, it will be amusing to see how thrift retailers will position themselves to remain competitive and provide value to its customers and investors.